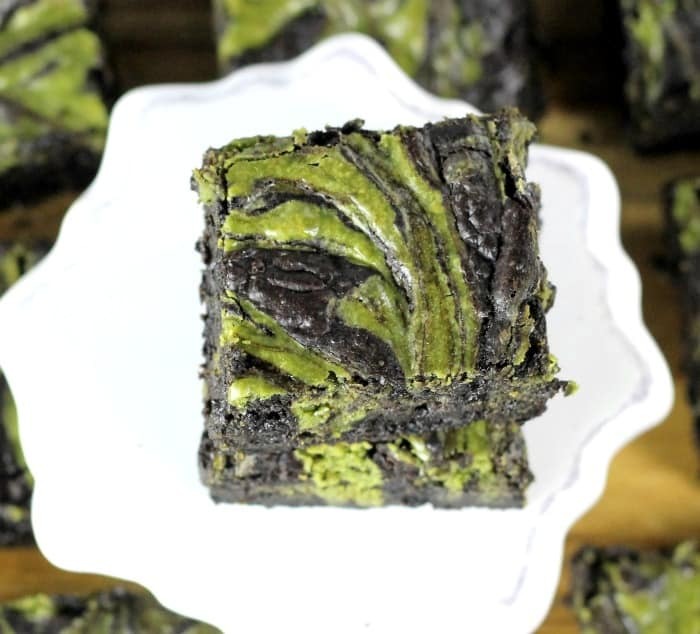 Bring on Halloween with these wickedly good Matcha Cheesecake Swirled Dark Chocolate Brownies! 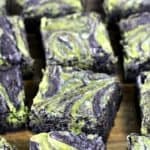 Moist, rich dark chocolate brownies infused with Matcha green tea cheesecake swirls are so bewitching with that vibrant, earthy green color, don’t you think so? 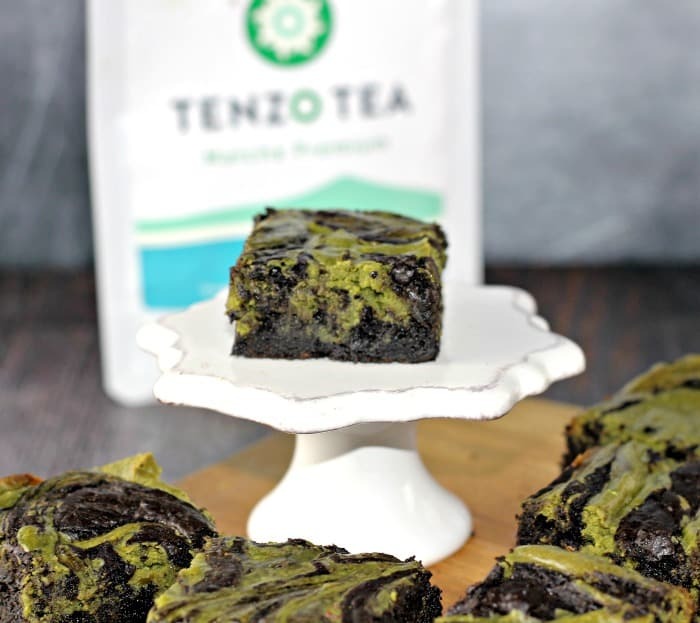 So, the co-founder and Chief Executive Officer of Tenzo Tea, a Matcha green tea company based in Los Angeles contacted me to ask if I would be interested in creating a recipe using their product in a recipe on the blog. How could I resist? 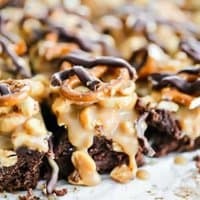 Like these Vanishing Black Cocoa Brownies, OMG Peanut Butter Cup Brownies, ‘Kiss Me’ Red Velvet Brownies, Best Caramel-icious Frosted Brownies, Double Chocolate Mascarpone Brownies, Chocolate Chip Cookie Dough Buttercream Brownies and these Orange Butter’Scream’ OREO Brownies just to name drop a few. Well! Matcha is a finely ground Green Tea powder made from the young and nutrient rich leaves of the green tea plant. Matcha powder is traditionally whisked with hot water to make a rich and frothy green tea, but can also be used to make lattes, smoothies, baked goods, and much more! Matcha has the highest antioxidant rating of all major superfoods and naturally comes with a perfect dose of caffeine for a clean and focused energy boost. The best Matcha Green Tea in the world comes from Japan. The Japanese have spent the last 1,000 years refining the process of growing green tea and have perfected the art of producing Matcha. Matcha Green Tea has many, many health benefits that are super powerful. A lot of people don’t like green tea because they think it tastes bitter and grassy. That concept is usually because they are drinking low quality green tea and don’t know there is a difference. You need the good stuff people! 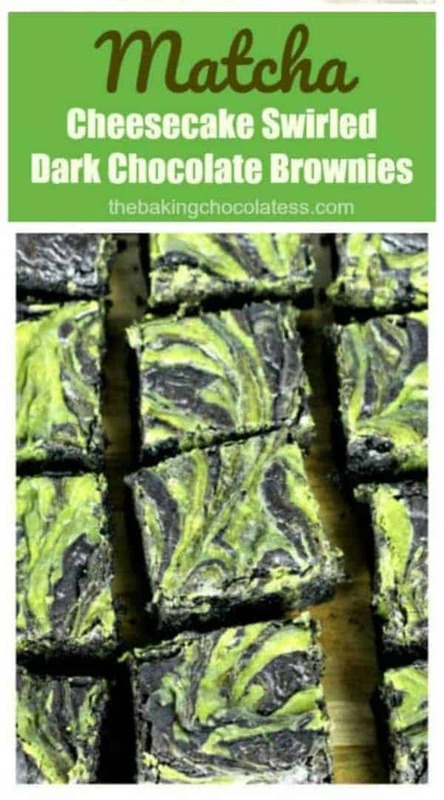 Because Matcha does have a unique earthy, bittersweet taste and a lingering sweet aftertaste, I chose to put it in some in cheesecake batter and swirl it in some yummy dark chocolate brownies. I think they look super cool for Earth Day, Halloween, Christmas, Easter and St. Patrick’s Day, don’t you? If you’ve never tried green tea, try it out! I remember when I first tried it, it took some time to get used to the flavor, but, if you think it’s too bitter, you can sweeten it with some honey. And I do it for the benefits. You cannot beat that! 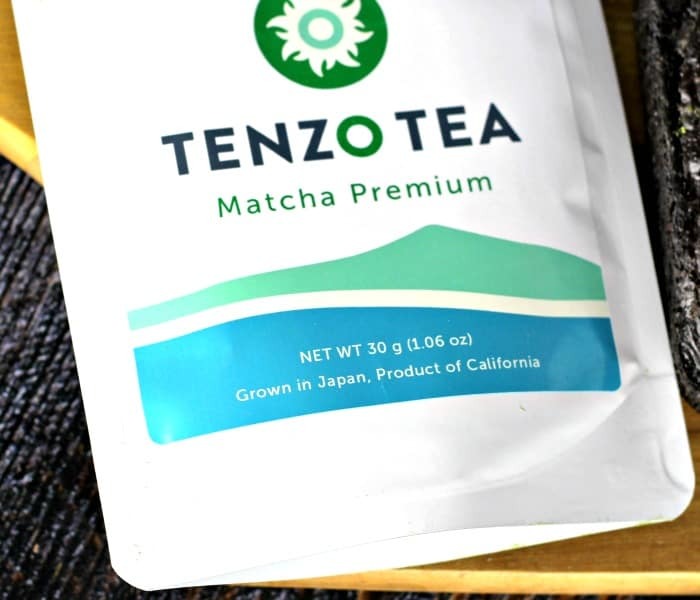 For more information on Tenzo Tea go here. 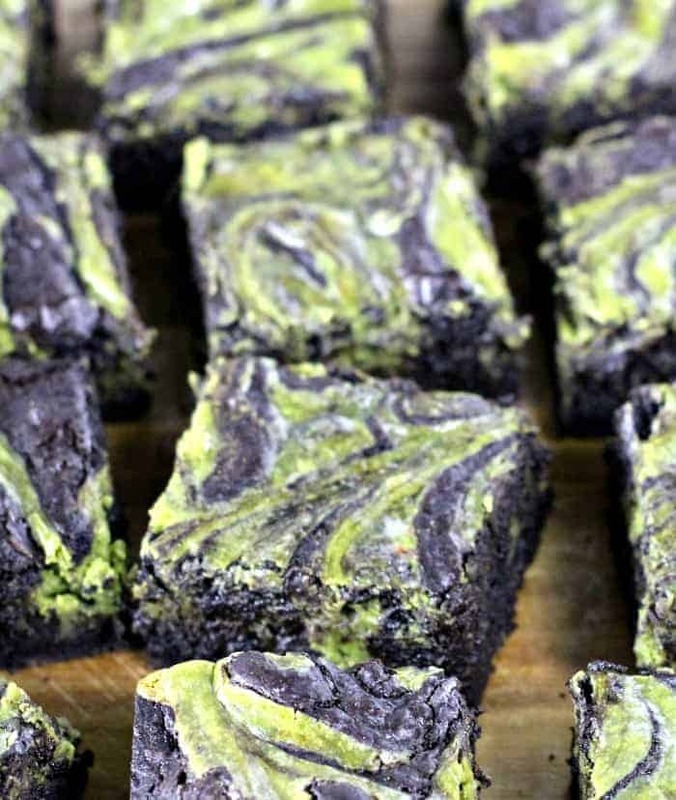 Matcha Cheesecake swirled in dark, decadent chocolate brownies have a green tea kick to 'em! Preheat the oven to 325 degrees Fahrenheit. Line an 8-inch square baking pan with 2 pieces of parchment paper, criss-crossing them, making sure that the paper is long enough to go up the sides a couple of inches. Grease the parchment paper. Melt the butter in a medium-sized saucepan over medium heat. Remove the pan from heat and stir in the sugar. Add the cocoa powder(s), salt and baking powder. Stir until the ingredients are incorporated well. Let the mixture cool for 5 minutes. While the mixture is cooling, make the Matcha cheesecake topping. In a separate bowl for the cheesecake topping, using a mixer beat together the cream cheese, the yolk, sugar, Matcha powder and vanilla extract until smooth. Add the eggs to the brownie mixture, beating vigorously with a wooden spoon or silicone spatula until the mixture well blended and shiny. Mixture will be thick Then add the chocolate or vanilla extract and the flour. Stir until you no longer see streaks of flour. Then beat vigorously for 50 strokes with the wooden spoon or spatula. Fold in the chips. The mini chips will melt into the brownie batter. Portion about 3/4 of brownie batter into the prepared pan. 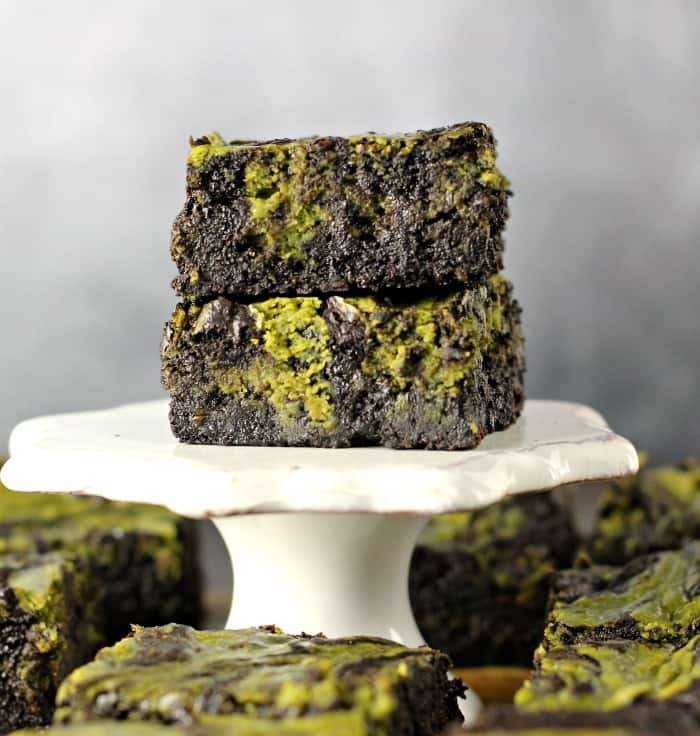 Add the matcha cheesecake to the top of the brownie batter in tablespoon dollops. 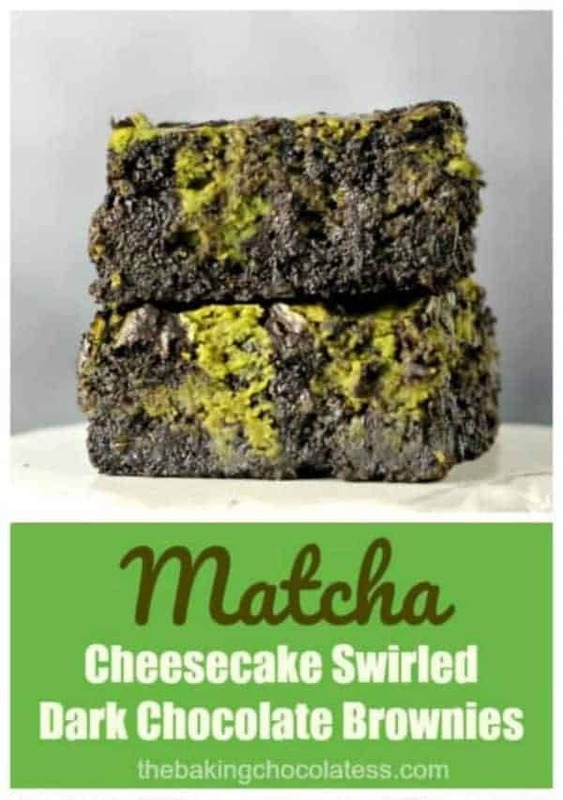 Add the remaining 1/4 of the brownie batter to the top of the matcha cheesecake layer in tablespoon dollops. 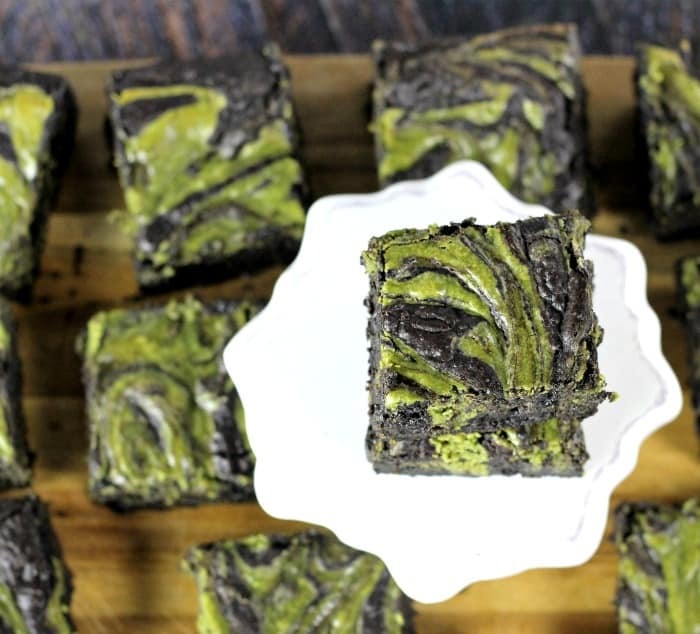 Use the tip of a paring knife to swirl the brownie batter & matcha cheesecake into a marbled pattern. Bake 35 to 40 minutes on the lower rack in the oven, until the batter in the center of the pan feels just set. Let cool, then lift the brownies out holding the parchment paper and peel it away. Cut the brownies into squares. Brownies will last 2 days at cool room temperature, 5 days in the refrigerator, or 1 month double wrapped in the freezer. If you want to tone down the green tea taste, decrease to 1/2 tablespoon of the Matcha. *To achieve a beautiful green hue with your matcha cheesecake, it is recommended to use a top quality culinary matcha like Tenzo. Low quality matcha will not be vibrant green, but instead will result in a dull brownish color. 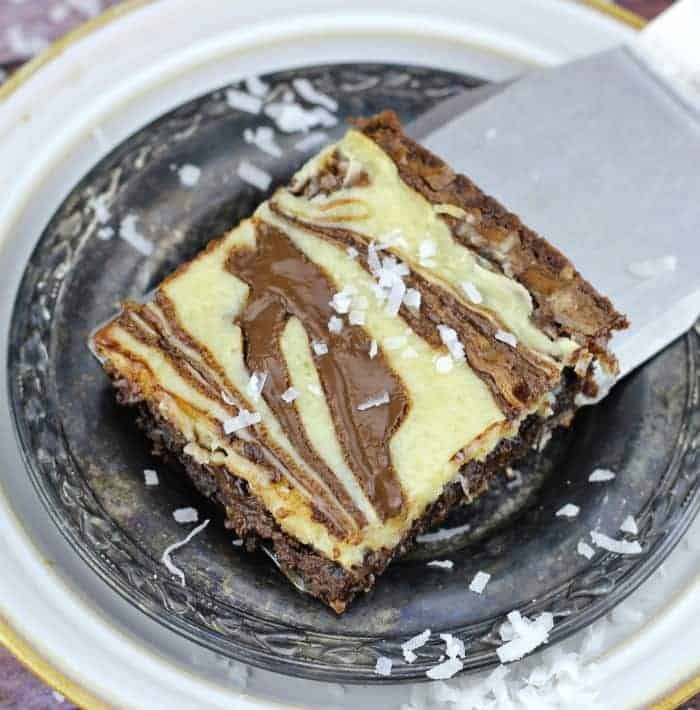 These brownies look so cool!! The matcha green is so vibrant! 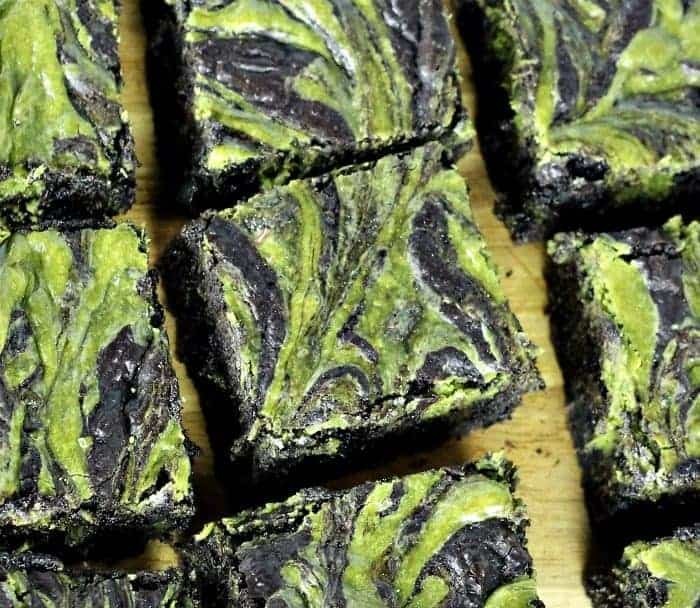 Love the idea of incorporating matcha tea powder in those gooey chocolate brownies! Great creation Kim !! These brownies are tooooo pretty! I love that vibrant green :). And they’re pretty dang perfect for Halloween! Or just a regular Monday when all I want to do is hide under the bed and eat chocolate and wait for the weekend. . .
LOL you and me both Kelsie!! Thank you dear! 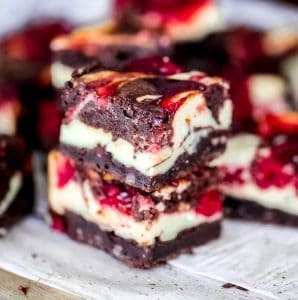 Bewitching is the perfect adjective for these gorgeous swirled brownies! Delicious, too! Aha! Spell-binding! Thank you Liz!